Imagine a flawlessly made up face, essentially gifted with a single tool. From every angle your foundation, highlight and contour are seamlessly blended into a beautiful and indisputably magical display of art. The BeautyBlender sponge is arguably one of the best makeup tools to achieve this goal. So let’s go deeper into the details and learn what BeautyBlender is and how to use it in your makeup routine. BeautyBlender is an edgeless, teardrop-shaped multi-tasking makeup sponge applicator, typically seen in a bright pink color, made of a special non-latex foam material, which allows flawless and effortless makeup application with minimum product waste. Thanks to its unique open cell structure, it holds water, but not product, allowing you to use less product, whether you are trying to apply liquid or powder-based products with this sponge applicator. This magic tool is perfect for applying foundation, makeup primers, blushes, eyeshadows, lipsticks and other makeup products, so what’s not to love? 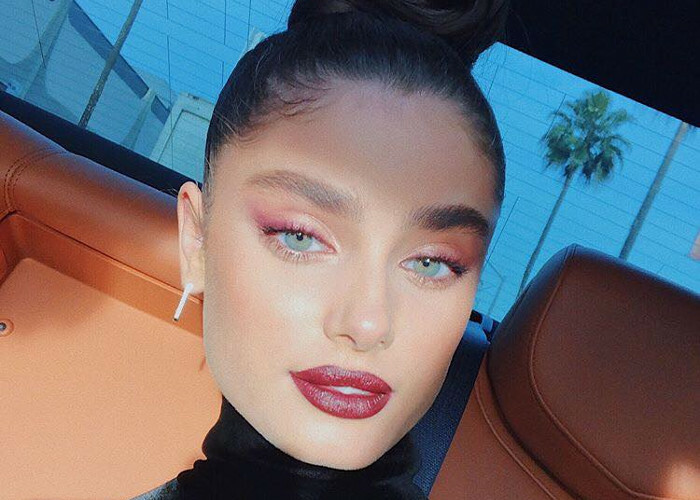 This well-designed little wonder came to be thanks to celebrity makeup artist Rea Ann Silva and it definitely makes the difficult-to-obtain seamless look a much easier feat. For those with extremely sensitive skin, the white blender is the same tool without any dye. These makeup sponges have a plush feel and are made of an incredible material that offers more even blending and a smoother result because the makeup sits on top of the sponge rather than being soaked in. This is due to the open cells that only hold a minimal amount of water. Since you can use every inch of the BeautyBlender sponge, rolling and tapping to apply where you need you won’t need to search and switch between brushes. The shape is such an important selling point because it allows this tool to be the ultimate makeup multi tool. The shape of the Beauty Blender has been described as both egg shaped and teardrop shaped but the point is ” this is the first sponge with no edges. The rounded bottom is hand cut on every one because it is perfect to cover larger areas without creating a surface that is anything but smoothly blended. The smaller, pointier end is ideal for around the nose and eyes. How to Choose a BeautyBlender? • Original BeautyBlender, which is pink and is meant for applying foundation, powder, BB + CC cream, cream blush, and more. • BeautyBlender Pure, which is a white dye-free sponge meant for primer, serum, moisturizer, eye cream and foaming cleanser application. This one is ideal for women with sensitive skin. • BeautyBlender Pro, which is a beautiful deep black sponge ideal for building up	long-wear makeup, applying bronzer, self-tanner and for male grooming. This one is perfect for professional makeup artists. • BeautyBlender Micro Mini, a cute little version in a pop of lime green that comes two to a pack and is ideal for applying	concealer, highlighter, contouring and acne spot coverage. How to Use Your BeautyBlender Sponge? The BeautyBlender sponge is marketed as makeup’s best friend with instructions to Wet, Squeeze and Bounce your way to a flawless face. A lot of people have many BeautyBlender makeup sponges, but most people do not need more than two: one for foundation and concealer, another for blush and highlighters. First wet the sponge, squeeze out the excess water and bounce/ pat or tap the sponge on your face to blend everything in. This works on liquid and powder foundation, blush and even nail polish (more on that later)! Once it has been wet the sponge expands into a fluffy expanded version of itself. If you are concerned that you might squeeze out too much or too little, use a paper towel. Just place the BeautyBlender in a folded over paper towel and squeeze firmly. The original is ideal for foundation in any form, both BB and CC creams, blush in both cream and powder forms and contouring. The BeautyBlender Pure is great for use with a foaming cleanser, and for sensitive skin and the most sensitive areas of the face, so use it to add primers and moisturizers, eye cream and serum. The Pro is for use with darker or heavier long-wear makeup and self-tanners and bronzers. Finally, the little green micro mini is great for everything the original is, in a more detail-oriented size. Concealer, contouring, highlighting and spot coverage are a breeze with these little versions of the miracle makeup sponge. It is important to remember to tap/ bounce or pat depending on your preference, even a tap and roll works, but do not do a sweep across the skin. Sweeping across the face would create streaks. For use with a concealer and foundation, add the product to your hand first if it is a liquid. Then use the dampened BeautyBlender to transfer and tap the product out across your face. The BeautyBlender sponge can be used dry as well. For example, if you bake your face, you can apply your powder under your eyes with the pointed end of a dry sponge then allow it to bake. A dry BeautyBlender can also be used to take up excess product if you went a bit heavier than you intended, especially when you have done so with a powder product. For use on cheeks and lips whether you are using a blush, stain or highlighter, use the large end of the BeautyBlender sponge for the cheeks and blush to spread it out softly and blend in seamlessly using the same tapping method. When it comes to lips, use the pointed end as a great way to soften a liner and create a fuller, sultrier pout. You can also use your BeautyBlender sponge to apply eye primers evenly and create the perfect base for your eye makeup. It’s also ideal for cream-based eyeshadow application, as well as for applying powder eyeshadows. BeautyBlender makeup sponges have been used to create stunning ombre nail designs. These can be found all over Pinterest and other sites, but it is important to note the nail polish does not wash out so you cannot use the sponge for as long and you obviously cannot go back to using it on your face. The version I tested was painting the colors in the order and in the direction I wanted the ombre to appear directly onto the sponge and then tapping it onto my nails. It was pretty and I can see doing it again, though I may try it with the micro minis to see if I like it better and have a backup. Popping a damp Pure (white) BeautyBlender into the freezer is great to soothe eyebrows after tweezing or waxing them. It’s a soft mini compress that you can quickly use with no worries. There are several ways to clean your BeautyBlender, with both liquid and solid cleansers. There have been many different suggestions and I tried a few myself on my BeautyBlender sponges to see what I liked most. I personally use the BeautyBlender original and the BeautyBlender solid. It’s great, gets out all the stains and it doesn’t take long, but it was all I ever used until recently. I enlisted the opinions of my sister, who is a MUA and my mother as well so to offer more complete results. Zote soap has been getting a lot of recommendation to use for cleaning brushes and BeautyBlender sponges. I know people who use it and love it, but I personally am allergic to coconuts so I was unable to try this one. So I had my mother and sister try it out on theirs, and it was fantastic. I can confirm that it cleans nearly as well as the BlenderCleanser solid from what I have seen. VERY nearly! And at the price of a very large bar vs the price of the BlenderCleanser solid it is an outstanding option to consider. There are other bars of soap that were tested including Dial and Dove. Dove did not fare as well as Dial, but the Zote soap was the favorite for price and feel afterwards according to my mother and sister. I preferred my BlenderCleanser bar. Regardless of which solid you use, just scrub the damp sponge against the soap and rinse until the BeautyBlender comes clean. I recently watched a video on Buzzfeed that used Johnson &	Johnson baby wash, olive oil and dish soap and the liquid BleanderCleanser. The baby wash did not really do much honestly, just as it appeared in the video. The olive oil and dish soap was amazing. The formula is 2 teaspoons of olive oil combined with 1.5 teaspoons of dish soap. Then you just roll the BeautyBlender around in the mix and massage it clean under a stream of warm water, squeezing when necessary. Just a quick tip, I prefer the antibacterial soaps like dawn. When you are done cleaning you BeautyBlender sponge correctly, just sit the sponge on top of the container to dry. When you set it big side down over the opening, it should sit and dry perfectly. The recommended shelf life of a BeautyBlender sponge is approximately three months. Not because the BeautyBlender will shred or anything, with proper use it should last the three months with no problem, but it is a sponge. For the sake of optimal hygiene and skin care, replacing your BeautyBlender every three months is the way to go. Where Can I Buy BeautyBlender? You can purchase your BeautyBlender online at Beautyblender.com, Sephora, Selfridges, Nordstrom, Cult Beauty	and nearly anywhere makeup is sold. The BeautyBlender makeup sponge is the answer to a lot of wishes and prayers throughout the makeup wearing community. Makeup is not always something that people understand; tutorials can be very confusing for some and frustrating for others. The BeautyBlender makeup sponge is a great option as it has improved the techniques of a lot of makeup wearers and has put them on more confident footing, thus makes them more willing to try out the looks they really want to. The best tools increase your confidence in your skills and Beauty Blender sponges are easy to use correctly and that is why they are so loved.